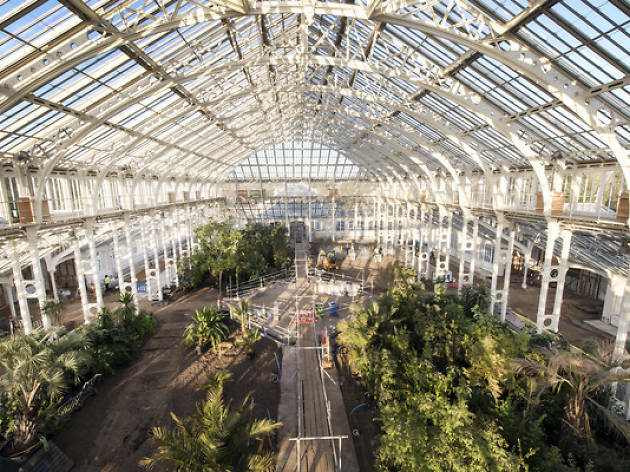 People in glass houses shouldn’t throw stones, and if you’re caught with so much as a bit of gravel in your hand while visiting this magnificent Victorian structure, there’ll be hell to pay. This ‘house’ has been under reconstruction for five years, but is set to reopen shortly. It’s large enough to hold three Boeing 747s, and is now overflowing with plants from temperate climes. Travel to the north end to visit Encephalartos woodii, a spiky cycad that’s one of the rarest plants in the world. Its kind outlived the dinosaurs, but this is thought to be the last specimen in Europe. Poor woodii. Kew Gardens. Station: Kew Gardens. Reopens Sat May 5. 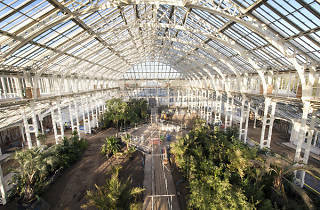 Get an exclusive preview of Temperate House this Friday with Time Out for £16. Hidden in a labyrinthine brutalist fortress, the Barbican Centre’s conservatory is a literal urban jungle. Over three levels it packs in more than 2,000 species of exotic plants cascading over the concrete, gurgling water features, ponds full of koi and turtles, and an Arid House with spiky cacti and pearly succulents. For the full experience, take time to amble over the walkways, which float at different levels among the greenery. If a more refined outing is your bag, book in for afternoon tea beneath the palms. Barbican Centre. Station: Barbican. Selected Sundays and bank holidays. Free entry. Not many London venues have an actual meadow on their doorstep, but that’s what you get at Petersham Nurseries. The nature keeps on growing when you step inside, where you’ll find a café (that’s actually a high-end restaurant), a shop and a tearoom encased in a glasshouse patterned with vines. The distressed furniture and giant antique pots are all part of the stately-but-friendly vibe. Go on, spend an afternoon fanning yourself in the balmy conservatory like a supporting character in a Georgette Heyer novel. Petersham Nurseries Café. Station: Richmond. Booking essential. Sitting atop the ‘in-progress’ Crossrail station, this construction looks more like the entry gate to Asgard than a rooftop garden. It has a futuristic lattice timber roof that opens at the centre to let the light in – and makes it look funky AF. The foliage isn’t just for show either. Many of the plants are indigenous to the countries once visited by the trading ships of West India Dock (now known as Canary Wharf). If trading history doesn’t get your propeller spinning, just sit and enjoy the overgrown space. Crossrail Place Roof Garden. Station: Canary Wharf. Free entry. Regent Street doesn’t scream ‘green and serene’, but this towering vertical garden installed at Anthropologie does. The 160 square-metre lush, leafy wall is packed with species known to improve the quality of air such as the peace lily and spider plant – so breathe deep next time you’re in there panic-buying a new outfit. Anthropologie Regent St. Station: Oxford Circus. Open daily.